Abstract: Background: Inadequate postnatal nutritional support in very low birth weight (VLBW) infants, particularly protein and energy deficits, may result in growth failure and poor neurodevelopmental outcome1. Optimal growth of preterm infants is challenging to achieve. Most preterm infants fail to grow after birth for days, and once they start to grow, they do not sustain normal intrauterine growth rates. This problem is worse in infants who have intrauterine growth restrictions (IUGR), infants with reversed end-diastolic flow (REDF), and infants with serious illnesses and physiological instability. As a result, most preterm infants do not achieve normal anthropometric indices by term gestation2. Several reasons are identified for poor postnatal growth and VLBW infants, including: delay in the start of adequate nutrition, providing inadequate rates of macro and micro nutrients3, delay in initiation of enteral feeding4, use of dilute nutritional mixes (e.g. unfortified human milk), and differences in practices between different neonatal intensive care units and between providers in the same unit5,6. There is a strong evidence in the literature indicating that early aggressive nutritional management for VLBW infants, especially protein and calories, is necessary to achieve normal growth and development during post natal life7. To achieve improvement in nutrition and growth outcomes in Tampa general hospital neonatal intensive care unit (NICU), we designed a quality improvement (QI) project that is based on standardize evidence-based NICU feeding guideline with a focus on maximizing protein intake in VLBW infants. Objective: From 2/25/2016 to 5/1/2017, >80% of infants who are VLBW or <30 weeks GA who are receiving human milk (maternal or donor) for initial feeds, will have an average growth velocity >13.2 g/kg/day (VON top quartile) at initial disposition. Design/Methods: Infants were excluded if the mother’s own milk (MOM) is contraindicated, if they have a diagnosis of intestinal anomalies or genetic syndromes, if admission occurred after 7 days of life, or if the infant was transferred out or expired before 14 days of life. An interdisciplinary team was formed, evidence-based NICU feeding guidelines were developed, and we used the IHI QI model of multiple Plan-Do-Study-Act (PDSA) cycles to develop change strategies. Project scope included the time from NICU admission to initial disposition. Key drivers identified were: regaining birthweight by day 14; exclusive use of MOM by day 14; and achieving protein and fluids goals. Results: the mean gestational age was 27.8 weeks and the mean birth weight was 1037g for the 83 infants included in the project. Goals were achieved in the following areas: regaining birthweight by day 14 (77% to 89%) and achieving goal protein intake on day 14 (29% to 72%). A trend towards improvement was achieved in the following areas: Average growth velocity of >13.2 g/kg/day at initial disposition (44% to 63%); weekly weight gain >15 g/kg/day in week 4-5 or 1 week prior to discharge (50% to 64%); and increasing average growth velocity >13.2 g/kg/day (44% to 63%). In addition, TGH NICU 2016 VON data showed an improvement in average growth velocity from 12.6 g/kg/day in 2015 to 13.2 g/kg/day in 2016. Identified opportunities for improvements include obtaining a lactation re-consult for suboptimal weight gain and increasing utilization of MOM. TGH’s NICU is participating in a multi-hospital MOM QI initiative to improve utilization of MOM in VLBWs. 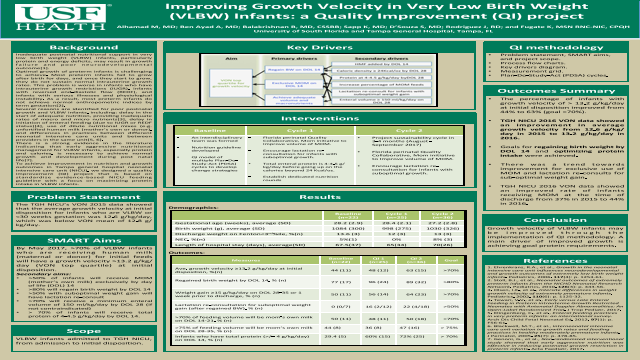 Conclusion: Increasing growth velocity in VLBW infants can be achieved by utilizing QI methodology, implementing standardized nutrition guidelines, and optimizing protein intake. Summary: Inadequate postnatal nutritional support in VLBW infants may result in growth failure and poor neurodevelopmental outcome. Optimal growth of preterm infants is challenging to achieve. Several reasons are identified for poor postnatal growth and VLBW infants. To achieve improvement in nutrition and growth outcomes in Tampa general hospital NICU, we designed a QI project that is based on standardize evidence-based NICU feeding guideline with a focus on maximizing protein intake in VLBW infants.References: 1. Ehrenkranz, R.A., et al., Growth in the neonatal intensive care unit influences neurodevelopmental and growth outcomes of extremely low birth weight infants. Pediatrics, 2006. 117(4): p. 1253-61. 2. Stoll, B.J., et al., Neonatal outcomes of extremely preterm infants from the NICHD Neonatal Research Network. Pediatrics, 2010. 126(3): p. 443-56. 3. Olsen, I.E., et al., Intersite differences in weight growth velocity of extremely premature infants. Pediatrics, 2002. 110(6): p. 1125-32. 4. Tewari, V.V., et al., Early versus Late Enteral Feeding in Preterm Intrauterine Growth Restricted Neonates with Antenatal Doppler Abnormalities: An Open-Label Randomized Trial. J Trop Pediatr, 2017. 5. Klingenberg, C., et al., Enteral feeding practices in very preterm infants: an international survey. Arch Dis Child Fetal Neonatal Ed, 2012. 97(1): p. F56-61.